Cathy Riggio is our Family Nurse Practitioner. 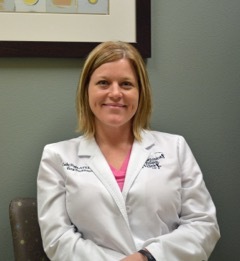 She joined North Oaks Pediatric Clinic in 2009 as a Registered Nurse. Cathy received her BSN and MSN from Southeastern Louisiana University. Cathy is also an Army and National Guard veteran. She and her husband have 2 kids. North Oaks Pediatric Clinic, L.L.P. ◦ Dr. Leo Westmoreland, Jr. M.D. ◦ Dr. Roger Rholdon, Sr., M.D. ◦ Dr. Chris Leumas, M.D. ◦ Dr. Francis Donner, Jr., M.D. ◦ Dr. Jean Tran, M.D. ◦ Dr. Samuel Hickey, Jr., M.D. ◦ Dr. Elizabeth Fritz, M.D.